The Arrival of the "Calculator-on-a-Chip"
During the late 1960s and early 1970s a major aim of the calculator electronics companies was to integrate all of the functionality of a calculator into one integrated circuit, so producing a "Calculator-on-a Chip". As told in the section "The Story of the Race to Develop the Pocket Electronic Calculator", from the mid-1960s one of the aims of the electronics industry was to integrate more of the functionality of a calculator into fewer integrated circuits so that less components were required and calculators became smaller and cheaper. Inside the Canon Canola 130S. 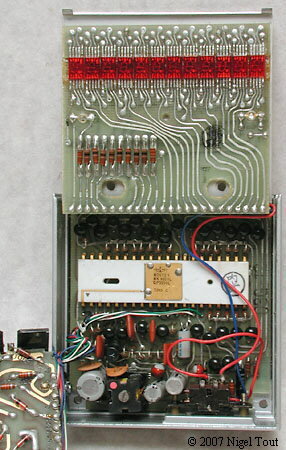 This is a typical calculator of about 1968 and requires 13 circuit boards full of components. The degree of integration was gradually improved. Here the Sharp QT-8B of 1970 has a 4-piece chipset manufactured by Rockwell. The development effort eventually led to several companies introducing, around the same time, integrated circuits that provided all of the functionality of a calculator in one integrated circuit - that is they employed a, so-called, "Calculator-on-a-chip". Note that the early "Calculator-on-a-chip" examples still required additional components for driving displays. The article "The Calculator that spawned the Microprocessor: The Busicom 141-PF calculator and the Intel 4004 microprocessor" explained that while the Japanese calculator company Busicom was developing with Intel the electronics for its 141-PF calculator, which was to lead to the Intel 4004 microprocessor, this very innovative Japanese calculator manufacturer had also commissioned Mostek of Dallas to push the limits of integration of calculator electronics by putting all the functionality on a single chip. Mostek was a new start-up company and desperate for sales. It estimated that it could design the layout for a single calculator chip in six weeks, but the first circuit design failed preliminary testing and the design eventually took three months. After frenzied development work the first ever "Calculator-on-a-chip" was produced in November 1970, as told in "The Chip" on an archive of the Mostek site. The chip was given the designation Mostek MK6010 and was immediately put to use in the Busicom Junior small desktop calculator, as shown below. 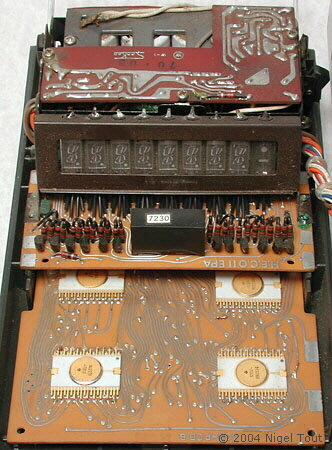 The cover of a Busicom Junior calculator has been removed to reveal the circuit board showing the single Mostek LSI chip mounted on a plug-in chip carrier. Cutting edge technology of 1971, the Mostek MK6010 "calculator on a chip" in a Busicom Junior calculator. The integrated circuit illustrated is date coded 7125 (i.e. 1971, week 25) and is also marked with the 'NCM' logo ( Nippon Calculating Machines—the original name of Busicom Corp.). "The apparent winner in the race to produce a calculator on a chip has hit the wire. Mostek Corp., of Carrolton, Texas, is now producing such a chip for Japan's Busicom Corp. ... The 180-mil-square [0.18 inches-square (4.6 mm-square)] chip contains the logic for a four function 12-digit calculator - more than 2,100 transistors in 360 gates plus 160 flip-flops. Its promise of lower labor costs means a giant step toward a calculator for the consumer market. ... ... Busicom's initial use of the chip will be as a direct replacement in its Junior model calculator now being distributed in the U.S. by National Cash Register." 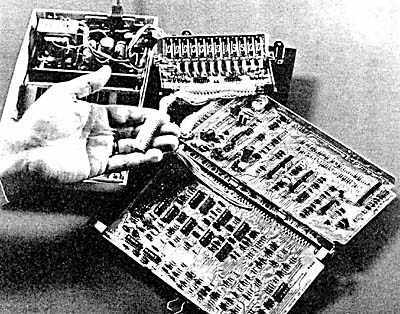 The chip held in the hand replaces the two circuit boards full of components, including 22 MSI (Medium Scale Integration) integrated circuits in the original Busicom Junior desktop calculator to produce the new version Busicom Junior. 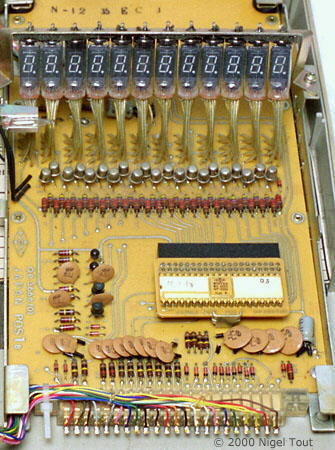 The single chip, using a p-channel semiconductor process, replaced 22 chips in the original Busicom Junior desktop calculator and reduced the number of circuit boards from two to one in the new version Busicom Junior. 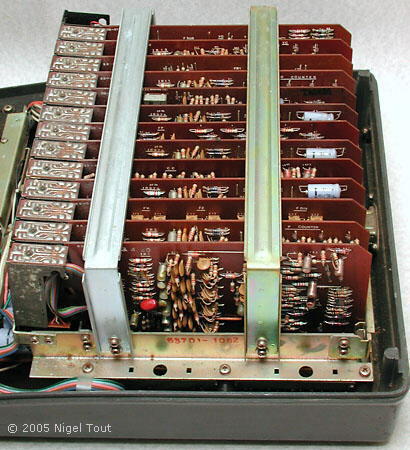 Note that separate transistors were still needed as high-voltage display drivers. The article continues ... "Busicom asked if Mostek could put a whole calculator on a chip. Cash [Berry Cash, Mostek's marketing vice president] says he balked at that but felt sure Mostek could put the logic on two or three chips even though the company had no previous experience in calculators. ... It decided to try for one chip, and consequently allotted six weeks for its layout. It took three months—and made meeting the rest of the schedule very difficult." Mostek of Dallas was then less than 2 years old and desperately needed the income that this project would generate. Continuing "The original calculator's discrete diode-resistor and IC logic was a very clever design, says Mostek, developed over many years and requiring nearly the minimum logic necessary for a four-function machine. ... the minimised logic contributed greatly to Mostek's success in putting a calculator on a single chip". The article also states "Though Mostek is best known for its ion-implanted MOS products, this circuit is made with conventional, high-threshold, p-channel MOS operating from -12 and -24 volts because it's compatible with the power supply in the calculator. However ... the same masks could be used with an ion-implant process to produce a low-threshold chip more suitable for battery operation". An article in the journal Electronic Design confirms that "A standard p-channel process was used to manufacture the chip. For the battery-operated, pocket-sized calculators, Mostek will use an ion-implantation technique to lower the chip's threshold voltage and reduce dissipation from 0.5 W to less than 50 mW." It appears that the low-threshold version of this "calculator-on-a-chip" for battery operation was given the 'L' designation of MK6010L, since this is found in early Busicom battery powered calculators. The MK6010L allowed the production of the first true pocket calculator, the Busicom LE-120A "HANDY" which was announced in February 1971. 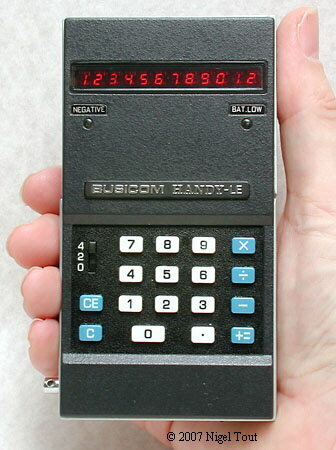 Busicom LE-120A "HANDY" using the MK6010L version of the "Calculator-on-a-Chip" developed by Mostek. This was the world's first true pocket calculator, small enough to fit in a shirt pocket, and also the first calculator with an LED (Light-Emitting Diode) display. It was announced in early 1971. The article announcing the Mostek "calculator-on-achip" was very prophetic when it said "Its promise of lower labor costs means a giant step toward a calculator for the consumer market". However, the Busicom LE-120A was very expensive, with a 12-digit display and a die-cast aluminium casing, and was out of reach of the man (and woman) in the street. Electronic Design reported in the article "The one-chip calculator is here, and its only the beginning" that there would be two models, one with LED display with a U.S. selling price of $395 and a Liquid Crystal Display version that would be somewhat cheaper. However, the Liquid Crystal version was only produced as a prototype and never went on sale. The Mostek MK6010 and MK6010L chips are only found in calculators manufactured by Busicom. Apparently the '6' as first digit indicates a Mostek bespoke design for a specific customer. The chip was later released for general sale as the MK5010, the '5' as first digit indicating for general sale. The MK5010P ('P' indicating "Gold Side-Brazed DIP" packaging) was used in several early hand-held calculators including the ground-breaking, low-cost, Rapid Data Rapidman 800. Subequently, Mostek produced improved chips in this series. It was evident that the price of the pocket calculator had to be reduced and soon Busicom launched a new, cheaper model with a plastic casing followed by further models, such as the Busicom LE-100A "handy", using Texas Instruments "Calculator-on-a-chip" ICs (see below). The resulting cheaper pocket calculators indicated the future direction for the market and soon many other companies were looking at making a profit by selling cheap pocket calculators. In the following years, with the dramatic reduction in the cost of calculators, Busicom's continuing financial difficulties finally got the better of it and it ceased production in 1974. However, the Busicom name was bought by a distributor and continues on calculators to this day, though manufactured by a variety of companies. "Like many MOS circuit makers, the Dallas company [Texas Instruments] is working to reduce the number of chips for a calculator set. Roop [TI's MOS marketing manager] says that designing and building a one or two chip calculator next year 'will be a snap'. This would make possible a calculator selling at $200 retail. Even more dramatic, TI is designing an MOS chip which would contain all the electronics for a calculator that would sell for $99—truly a potential high volume consumer product. And TI is thinking 'very strongly' of selling this bigger custom chip in 1971, he notes. If TI can get the price of this one chip down to between $15 and $25, then a $99 electronic calculator will be possible, Roop says." TI responded quickly after the announcement of the Busicom calculator with the Mostek chip, since also in February 1971 'Electronics Design' reported "Two days after Mostek announced its development of a calculator on a chip, another Dallas-based company Texas Instruments said that it, too, was completing development of a one-chip calculator that would be available "off-the-shelf" by June." The TMS1802 was actually announced in September 1971 and is a very sophisticated device, being in reality a single-chip-microcontroller optimised for use in a calculator. The journal 'Wireless World' reported "The i.c. contains an eight-digit b.c.d. 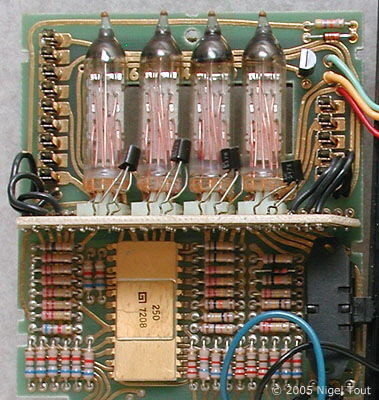 arithmetic logic unit; a three-register 182-bit random access store; a 3520-bit read-only memory for holding the programme; and timing, output, and control decoders. Floating-point or fixed-point operation calculations can be performed and there is automatic round-off of numbers and leading zero suppression. Arithmetic and control operations are based on a 4μs single-phase clock system." Thus the chip has an internal structure based on a processing unit linked to integral RAM and ROM. By employing different masks for the ROM during manufacture the functionality of the calculator could be adjusted. Texas Instruments later renamed this integrated circuit the TMS0102 and it was the start of a family of TMS01xx microcontroller chips that could be manufactured to be calculators or dedicated controllers. The TMS1802 was initially sold on the general market to calculator manufacturers, with Texas Instruments delaying the manufacture and marketing its first calculator, the TI-2500 "Datamath", until July 1972. Several models of calculator used the TMS1802 including the Sinclair Executive hand-held calculator (pictured below), the Texet 1 hand-held calculator, and the Advance Wireless World desktop calculator. Early Sinclair Executive calculators used the TMS1802NC "calculator-on-a-chip", here date-coded to 1971, week 37. The two smaller integrated circuits are LED drivers. At first the Sinclair Executive used the TMS1802NC in a novel way where the power to the chip was pulsed to reduce the power consumption in order to give long life from the button cells used. The TMS0100 family of calculator-on-a-chip MOS/LSI integrated circuits, introduced by Texas Instruments last year as the TMS1802, has been expanded to nine off-the-shelf circuits. The TMS1802 is a specific implementation of a basic or host calculator chip. Any number of operational characteristics can be implemented by the manufacturer using single-level mask programming techniques of the same basic or host design. The only limitations are the size of the program ROM, the RAM storage, and the control, timing, and output decoders. Four of the nine calculator circuits are considered preferred types. The TMS0101 and TMS0103 are the preferred eight-digit circuits. The preferred ten-digit circuits are the TMS0106 and the TMS0118. The TMS0101 has the following features of the one-chip family: floating- or fixed-point result, chain operation, constant operation, protection of result in overflow, underflow in fixed-point mode, leading zero suppression, automatic power-on clear, and automatic sequence and powers. This eight-digit version uses algebraic keyboard entry—the user presses the keys exactly as he would describe the problem. The TMS0103 provides eight digits, four operations, ﬂoating or ﬁxed decimal point, constant or chain operation, automatic roundoff, overflow and underflow, leading zero suppression, and automatic power-up clear. This variation uses the arithmetic keyboard entry system—the same as standard business machines—and is ideally suited for most desktop machines. The TMS0106 and TMS0118 are both ten-digit versions. Both feature a three-position selectable roundoff that uses a switch to determine how a number will be rounded—up, down, or off—when in fixed-point operation. The TMS0106 uses arithmetic entry; the TMS0118 uses formula entry. All nine of these units are available immediately from stock. Price in 100-piece quantities for the elght-digit chips is $38.15, and $41.97 for the ten-digit ones." The TMS0100 series proved to be a very popular family of chips for use in calculators during the 1970s. By developing the TMS01xx system further TI went on to produce the very successful general-purpose TMS1000 micro-controller series, examples of which were also used in high-specification calculators later in the 1970s. In 1970, four design staff from General Instrument (GI) left to form Pico Electronics Ltd. The group was based at a semiconductor fabrication plant in Glenrothes, Scotland, founded by Elliott Automation which had recently become redundant. Having detailed knowledge of designing calculator chip sets for GI, the group was financed by GI to develop single-chip calculator integrated circuits for which GI would have exclusive manufacturing rights. Starting with the GI 250 "calculator-on-a-chip" Pico went on to develop a range of calculator ICs which were manufactured by General Instrument and sold to calculator manufacturers such as Bowmar, Litton, and Casio. These integrated circuits also had a processing unit linked to integral RAM and ROM, which allowed for some change in functionality by altering the ROM mask during manufacture. The first of the ICs, the GI 250, was used in the Litton Royal Digital III, which was announced in January 1972 and manufactured by the Monroe division of Litton Industries. 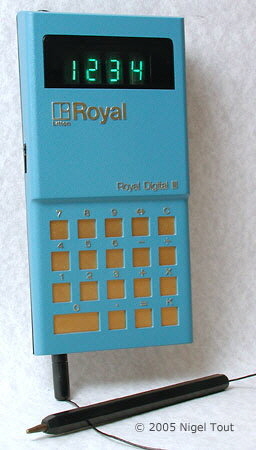 Royal Digital III, showing its unusual stylus keypad, 4-digit Vacuum Fluorescent Display (VFD), and GI 250 "calculator-on-a-chip", here date-coded to 1972, week 8. Soon, other semiconductor manufacturers had developed their own "calculator-on-a-chip" for simple calculators. The introduction of the "calculator-on-a-chip" was a significant part of the "calculator war" which was starting, where the cost of calculators plummeted during the first half of the 1970s as the cost of components decreased. "The Chip: Mostek engineers had to make history", http://web.archive.org/web/20120121071408/http://www.mindspring.com/~mary.hall/mosteklives/history/10Ann/thechip.html. "Single-chip calculator hits the finish line", Electronics, Feb. 1 1971, p19. "The one-chip calculator is here, and it's only the beginning", Electronic Design, Feb. 18 1971, p34. Henkel, Robert, "Hand in hand", Electronics, November 23, 1970, p83. "Calculators are in chips; Next: Minicomputers? ", Electronic Design, Feb. 18 1971, p21. "Calculator i.c. ", Wireless World, november 1971, p557. "MOS/LSI family expanded to nine standard 'calculator on a chip' circuits", IEEE Spectrum, November 1972, p80.